In 1745, Adam Trollinger established a homestead on the banks of the Haw River. From that beginning, the community of Haw River was developed. Trollinger was a native of the Rhine River valley in Germany and had lived in Pennsylvania before heading south to seek a new life. His settlement was very near the site of an earlier Sissipahaw Indian Village. Trollinger chose the spot because it had an easy crossing while nearby the river moved with enough power to drive a mill wheel. In 1748, Adam's son, Jacob, built a grist mill, one of the first industries in the wilderness area. A village known as Trollinger's Ford grew up around the mill. Lord Cornwallis passed nearby during the last days of the Revolutionary War. His foraging soldiers raided Trollinger's mill and confiscated the miller's grain. When Jacob confronted the redcoats, they bound him to a tree with a bridle bit in his mouth. Upon his release, Trollinger sent two of his sons and a slave to help fight the British. Benjamin Trollinger built the first part of the Granite Mill in 1844, marking the beginning of the textile industry in the village. It is the only ante-bellum mill building in Alamance County still in use. Since that time, the development of the town has been inextricably linked to events at the mill. 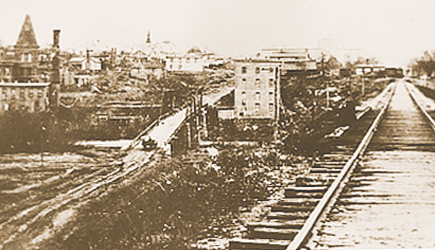 In 1849, the North Carolina Railroad was chartered and Benjamin Trollinger secured its passage through the mill town by building a railroad bridge over the river at his own expense. The town became known as Haw River Depot. Benjamin Trollinger also was instrumental in locating the railroad repair station at Company Shops a few miles west. As a result of financial difficulties brought on by the failure of Trollinger's hotel in Haw River, E.M. Holt and his son, Thomas M. Holt, acquired the mill in 1858. In 1861, Thomas M. Holt bought his father's interest in the property and moved to Haw River to oversee the running of the mill. During the Civil War, much cloth was shipped to Raleigh for Confederate uniforms. As the war drew to a close, gold and other treasures were hidden near the railroad line in and around Haw River, and tales of buried treasure persist. In 1868, Thomas Holt's brother-in-law, Adolphus "Dolph" Moore, became partner in the mill and the operation was called Holt and Moore. George Swepson came to town and barges began carrying raw cotton to his mill in Swepsonville and returning with spun products to be shipped by rail. About 1870, Holt and Moore built a one-room meeting house near Trollinger Cemetery. Four churches trace their roots to that tiny building. In 1876, Dolph Moore was found shot in George Swepson's yard. When Moore died, George Swepson was charged with the crime. Though acquitted, he was forced to leave town. The mills became the Thomas M. Holt Manufacturing Company. Haw River developed as a typical mill village in which the mill owned the homes of the millworkers and operated the company store. Many people moved from family farms to the community around the mill. Community life centered around sections within the town like Red Slide, Pine Knot, Sugar Hill, and Johnson City. In 1881, Thomas M. Holt built a power dam across the river and a second mill across the street from Granite. Holt's progressive management of the mill and his leadership of the NCRR and the Grange led to a term as governor between 1891 and 1893. He died in 1896, leaving his son, Charles, to run the mill. The mill underwent several changes in management in the first quarter of the twentieth century. The county opened the Haw River School in 1904, and by 1918 most of the one-room schools in churches and private homes were closed. The last graduating class of the high school was in 1962. The building was remodeld to become an elementary school. The railroad bridge was the scene of derailments in 1911, 1936, and 1960. The last wreck damaged the depot which led to its demolition. 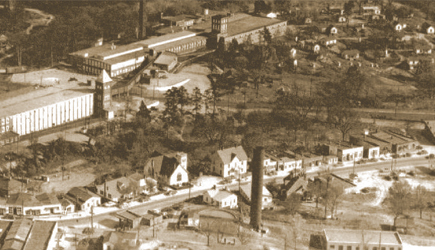 In 1928, the cotton factories in Haw River were acquired by Proximity Manufacturing, which later became Cone Mills Corporation. When corduroy became popular, the company decided to produce the cloth in Haw River. The plants south of main Street were renamed Tabardrey and were equipped with new machinery to produce corduroy. The mills north of the highway became Granite Finishing for the finishing of the cloth. Corduroy production began on May 1, 1930, and Granite was shipping finished goods by June of the same year. The little town thrived in the years following World War II. Businesses flourished on Main Street in the 50s and the Cone plants became the largest producers of corduroy in the world, employing over 1000 people in 1981. William Kerr Scott served as governor of North Carolina from 1949 to 1953 and from 1969 to 1973 his son, Robert Walker Scott, held the same office. Both men had Haw River addresses so that the only three governors from Alamance County are claimed by Haw River. Haw River was officially incorporated on June 1, 1973. The Haw River Municipal building was dedicated on Sunday, July 18, 1976 as part of the nation's Bicentennial. The Haw River Municipal Park was opened on August 7, 1981. Beginning with the Indians, many have crossed the river where the town is situated - some just passing through and others coming to live and work. Still others left their birthplace here to make their marks in the wider world. There is much to celebrate in the personalities and events that graced Haw River over the years and likewise been influenced by rhe river community. Today's citizens carry on in the traditions of industry and community that have long been the hallmarks of this special place. With pride in the past, they look to the future with confidence and optimism.